I’ve noticed a trend with VMware specialists beginning to dabble in the word of AWS, which isn’t really surprising considering the two companies announced a strategic partnership with the introduction of VMware Cloud on AWS. 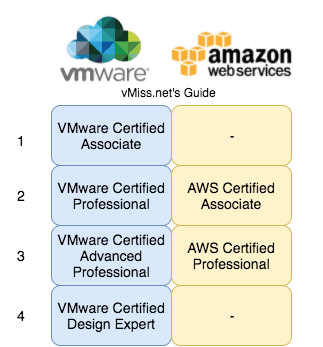 So the question remains, if you’re a VMware specialist looking to get started in the world of AWS, what do all of these AWS certifications mean? What are they like? How hard are they? Or, perhaps, you’re going in the other direction, you’ve been spending a lot of time with AWS and the VMware partnership has you intrigued. Either way, here’s a handy guide to get you started. You can find VMWare’s official certification site here, and AWS’ official certification site here. These sites are the starting point for everything certification related. One commonality between both types of certifications are the certification blueprints. The blueprints tell you the topics and technologies you need to study for each certification type. A good rule of thumb? Read the blueprint! As you can see, there are many different facets of either technology to become familiar with, or become certified in. VMware and AWS use different terminology for their certifications which can be confusing between the two tracks. Instead, I’m going to use numbers to try and make them make sense, and compare them. Take a look at the handy dandy graphic below. VMware has more “levels” of certification compared to AWS at this time. This, of course, isn’t surprising since VMware has been around a lot longer. 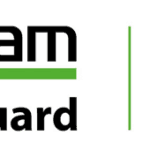 If you take a look at the level 2 and 3 certifications, that’s VCP and VCAP for VMware, and Associate and Professional for AWS. You’ll notice they map to each other nicely. If you go further and read their blueprints, you’ll see that the level 2 and 3 certifications are really testing the same sort of skill set for both technologies. The big fundamental difference here is that VMware test’s all of a candidates skills in a given solution track if the track is followed to completion, versus Amazon having specific tracks for something like Architecting and Operations. For example, if I follow the VMware DCV track, the VCP will test my basic knowledge, the VCAPs will test design and hands on skills, and the VCDX will test pretty much any skill you may need in a successful virtualization environment from basic knowledge, to design, to operations. On the other hand, if I start on the AWS Architect track, I’m not being tested as heavily on the operational skills since that is a solution track of its own. Don’t get me wrong, you’re still expected to know some basics, but you won’t get into the nitty gritty of other tracks on yours. I hope this guide is enough to get you started on understanding some of the comparisons between the two certification tracks. Now is an exciting time to be involved with both VMware and AWS technologies, and what better way to get your feet wet than to start looking at some of the certifications. Good luck, and remember, don’t forget to read the blueprint!